For the sixth year in a row, ranchers in Washington’s wolf country partnered with Conservation Northwest to demonstrate the effectiveness of range riders for deterring conflicts with wolves. The Project also focused on sharing knowledge in 2016, hosting ranchers and range riders from our state on two trips to Montana to learn from ranchers who coexist with wolves. The Range Rider Pilot Project is a collaborative effort between Conservation Northwest and local ranchers. We also coordinate with the Washington Department of Fish and Wildlife (WDFW), independent wolf experts, professional scientists, and other partners to support this project. Whether riding the range on horseback, walking pastures on foot, or traveling forest roads in four-wheel drive vehicles, these modern-day wranglers keep an eye on herds and provide a human presence to deter depredations. Their efforts support the safety of both livestock and native carnivores, and help build human tolerance for wolf recovery. This year we worked with seven ranchers in the territory of five wolf packs, from northeast Washington’s Smackout Pack and the Nc’icn and Strawberry packs on the reservation of the Colville Confederated Tribes, to the Teanaway Pack near Cle Elum and the Lookout Pack in the Methow Valley. In total, these range riders patrolled more than 280,000 acres on public land grazing allotments, home to approximately 3,000 cattle from May into October. These areas are also within the home range of more than two dozen confirmed wolves. Conservation Northwest provided approximately $50,000 in direct funding for range riders this year, as well as significant additional contributions of staff time, training and travel support. 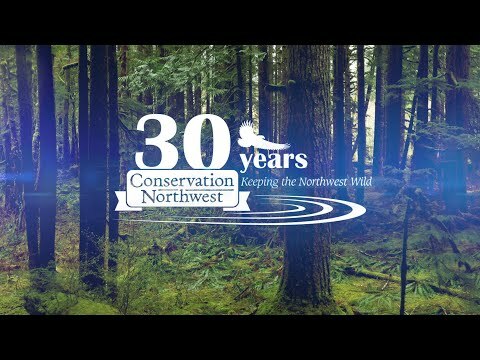 These funds come primarily from private donations, Conservation Northwest memberships, and support from non-profit foundations. Many ranchers in our project also receive matching funds from WDFW that help support gas, supplies, and other range riding expenses. State contributions come in part from a legislature-approved program that uses vanity license plate sales to fund the implementation of predator conflict avoidance efforts. Conservation Northwest also provided financial and other support in 2016 to local range riding businesses, range riders contracted with WDFW, and herd supervisors hired as interns as additional ways to bring the costs of range riding down or spread efforts to more ranchers operating in Washington’s wolf territories. The trainings we coordinated or participated in this year are a way for ranchers, range riders, conservationists and scientists to share knowledge and experiences, and are designed to find ways to better coexist with native predators with as few conflicts as possible. In addition to our annual springtime Rancher Range Rider Rendezvous (4R) meeting, we arranged for project partners to attend two Montana trainings: a summer trip to the Tom Minor Basin and an autumn trip to the Centennial Basin. Both areas have a rich and successful ranching culture, while also maintaining healthy populations of wolves, grizzly bears and other native wildlife. Our Range Rider Pilot Project manager Jay Kehne believes that ranchers in the Pacific Northwest can learn from the experiences of peers who have raised livestock in wolf country for decades. And building and sharing this knowledge can help improve range riding, livestock management and wildlife recovery in our state. While in Montana, ranchers at the clinics learned and then put into practice Low Stress Livestock Handling techniques that enable range riders to rebuild herding instincts in cattle, which helps ward off attempts by wolf packs to single out young, sick, or injured animals. While range riders cannot be present during all hours of every day, the benefits of increased herding instincts pay out even when human presence is not possible. One attendant from Washington was so impressed that he has offered to host a similar clinic in our state in 2017, something we look forward to helping organize. In addition to learning best practices from the Northern Rockies, ranchers in our state are adjusting to the reality of operating in wolf country, and proactive methods to keep conflicts to a minimum are spreading beyond the ranchers involved in Conservation Northwest’s project and similar range riding efforts led by WDFW. Kehne says that as Washington’s wolf population grows and expands into new areas, depredations will happen on occasion, and in some cases wolf management may be required if preventative methods fail and conflicts are persistent. But with more ranchers adopting range riders, guard dogs, or other proactive deterrence methods, livestock operators in wolf country feel more empowered than they did when wolves first returned to our state. And that’s leading to greater social tolerance for these native carnivores, something that’s vital to ensuring that wolf recovery is durable over the long-term. In 2016, two ranchers involved in Conservation Northwest’s Range Rider Pilot Project each had one calf attacked, leading to a confirmed depredation by the Smackout Pack. Experiences like these are a reminder that the road to coexistence between people, livestock and predators is not easy. However, these losses did not become habitual, and no lethal management of wolves from this pack was pursued. We’re hopeful that continued diligent range riding in this area will keep future losses to a minimum, and help avoid drastic impacts to either the ranchers or the wolf pack. Coexistence with healthy wolf populations is achievable in Washington. And whether it’s learning from the experiences of their counterparts in the Rockies, sharing knowledge with scientists and conservationists, or riding the range to keep both cows and wolves safe, ranchers and range riders in our state are working hard to make that goal a reality. Conservation Northwest is committed to continuing to support these efforts in the years ahead through our Range Rider Pilot Project, helping pave the way for the long-term recovery and public acceptance of wolves alongside thriving rural communities. *Editor’s Note: You likely heard about conflicts with the Profanity Peak Wolf Pack this summer, including that seven pack members were culled by WDFW as a response to persistent depredations on cattle. The ranchers involved in these incidents were not participants in our Range Rider Pilot Project, though they did employ some conflict avoidance measures. A range rider hired by WDFW also operated on livestock grazing allotments in this area. Our perspectives on these incidents can be found here. Learn more about the Range Rider Pilot Project, and read updates from past seasons, at www.conservationnw.org/range-rider-project. More information on wolf recovery and our wolf advocacy work can be found at www.conservationnw.org/wolves.